Duke Memorial United Methodist Church is a historic Methodist church at 504 W. Chapel Hill Street in Durham, North Carolina. It was originally established in 1886. 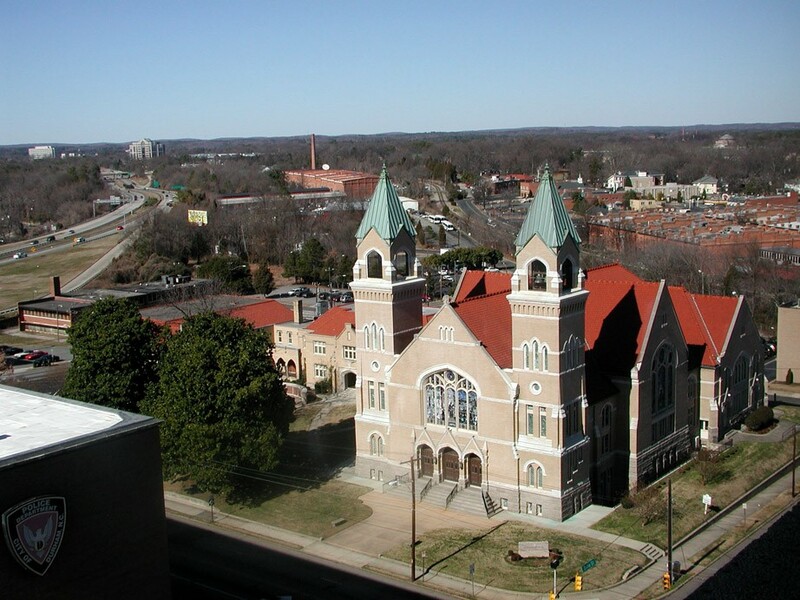 The congregation’s growth paralleled Durham’s growth as a manufacturing center in the textile and tobacco industries and has maintained a close connection with Duke University (formerly Trinity College). From its beginning, the church has counted among its members many of Durham’s educational and industrial elite. It is named in honor of tobacco magnate and philanthropist Washington Duke and his sons, who were instrumental in the building of the church. Industrialists like Washington Duke and Julian Carr did not want Durham to be only a wealthy city; they hoped that Durham would grow into a city which also had culture. Durham at this point was an economic boom-town, with the potential to become a rowdy and unorganized industrial city like many others in the American south and west. Thus they encouraged the founding of institutions of civilized society, like churches and institutions of higher education, to accompany Durham’s material growth. The establishment of Trinity College in Durham and the building of this church are two primary examples. Read the full history report on Wikipedia. *You can pick up a copy of both books in the church office. Searching the Duke Memorial UMC archives, housed at Duke University by the Divinity School Library, is easy once you get the hang of it. Tom McCauley provided funds to enable this project to take place; it is guided by the church’s history committee.